I'm going to mix it up (like my pun?) today and go with a very modern drink. I'm doing this in honour of one person in particular - Darcy James Argue. He is an acquaintance of mine who is the composer behind the fantastic 'steam-punk' modern big band, Secret Society. Here is the NY Times online article. I had the pleasure of seeing Darcy James Argue's Secret Society when they played the Vogue Theater in Vancouver, and it was quite a mind-blowing show. Darcy's compositions are so dynamic and fluid and the musicians he has in the band are fantastic. I encourage you to pick up a copy of the album, which is on ITunes or at HMV. You can also check out some of the music online here. So in honour of what he's doing in New York right now, I'm going to share one of my favourite whiskey cocktails - The Red Hook, named after the NYC neighbourhood, as many cocktails are (the Manhattan, The Brooklyn, The Bronx, The Bensonhurst, etc). The Red Hook is a variation on the Manhattan, or moreso, a variation on the Brooklyn cocktail, which is whiskey with maraschino, dry vermouth, and Amer Picon (unfortunately impossible to find - the only place I've seen it in Vancouver is at Boneta, where one of the bartenders had his dad send it over from France). The Brooklyn is a real treat and a real classic, dating back to before the 1920's. There are some very delicious and interesting modern variations in which bartenders are experimenting with the bitter component and the vermouth component (a Manhattan being whiskey, sweet vermouth, and Angostura bitters), using an amaro or even Chartreuse to mix things up. The Red Hook was invented at the New York bar "Milk and Honey" in 2004 as a modern answer to the Brooklyn. While it's only three ingredients, each one balances the other so well that it's actually fairly complex on the palate. As with any simple drink like this, it's easy to make a mediocre one and really hard to make a perfect one, so I definitely suggest having one made by a good bartender for your first try if you can. The drink has a whiskey base - and it's best to use American rye if you can, but that's no easy feat for us up here - with Punt e Mes sweet vermouth to balance, and Maraschino liqueur to modify. As for the name, Red Hook is a neighbourhood in Brooklyn, NY, that was built in the 1600's and named after the shape of the land projecting into the bay, and after the red clay soil in the area. In the 1990's it was named the "crack capital of North America," but has taken a turn for the better. It has some very cool associations, with such dudes as Al Capone, and is the setting for an H.P Lovecraft story, the movie "On The Waterfront," and the birthplace of Captain America. Stir in a mixing glass or container with ice and strain into a cocktail glass. Garnish with a cherry (or a lemon twist will bring out a nice flavour as well). I stress diluting simple and strong drinks like this because it really helps to balance the flavours. If it isn't tasting right, add whiskey to balance, not the other ingredients. 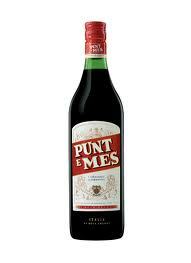 So, what is Punt e Mes? It's an Italian (sweet/red) vermouth made originally by the Carpano family, who were behind the first real Italian vermouth recipe, Carpano Antica (which is incredibly good and complex, but runs about $90 per bottle in Canada - if you can find it at all). Punt e Mes tastes quite different from other sweet vermouths in that it is, first of all, more bitter, and I would say more interesting. Because of this bitter character, though, cocktails won't balance the same with it as they will with a regular rosso, but it makes for some fun variations and experiments. There is bitter orange in there along with the very herbal vermouth flavours. You can find it in Canada, but not in the government liquor stores. I got mine at Viti on Seymour downtown for $30 or so. If you're looking for something new and interesting, I definitely suggest getting it - even if just for making Red Hooks because they're so good. 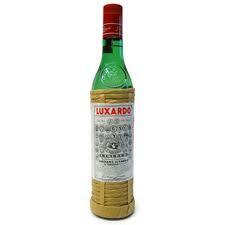 Maraschino liqueur is integral to a lot of classic cocktails, and you need to get yourself a bottle if you're really getting into making drinks. Unfortunately, once again, you can't get it at a government liquor store, but I see it often in independent stores, such as Brewery Creek on Main Street, or the one in the Park Royal Village. It's also about $30, but will last you a long time because it's so potent so you'll only be using small amounts. Maraschino is NOT a cherry-flavoured sugar syrup, nor does it even really taste like cherries at all. It was first made by monks in Croatia in the 16th century, namely from marasca cherries and their sprigs. It has a very unique aroma and flavour, is somewhat bitter, but being a liqueur, it's also fairly sweet. Ok now here's the difficult part. The whiskey. This is an American drink meant to be made with American rye, and in fact, you should make most whiskey cocktails with American rye because they're delicious and interesting. The problem, possibly the most painful of our liquor problems in Canada, is how hard it is to get American rye. Finally, we're getting more brands in (just over the last year or so even), but they're really expensive. A good example is the bottle of Russell's Reserve 6 Year-Old I have on my shelf. It was a gift from my brother, and I believe he said it costs about $28 in the States. I have seen a couple bottles only very recently in our liquor stores, and it's going for $60. Don't use Canadian whiskey. As I've said before, it's boring. Ok, there are a couple brands or batches that are good (such as Alberta Springs 10 Year Old), but they still won't offer the spice or complexity you'll get from American, and ultimately you're wasting a cocktail like this by using Canadian. I have seen good bartenders mix a bit of nice bourbon with a smooth (but boring) Canadian whiskey like Alberta Premium to give it more character while making a drink such as the Red Hook, which brings me to my solution. We can get bourbon here - affordably. So, while the drink is meant to be made with rye, if you can't get any or can't afford any, use bourbon. You can get some nice ones (Bulleit has a high rye content, but Buffalo Trace is very nice... if you're going for the cheap solution, get Wild Turkey because it also has a high rye content) from the government liquor stores. Or take a trip down the States. You can get Old Overholdt for like $19, and it's way better than most Canadian whiskeys up here! So, if you're interested in trying a modern cocktail with a traditional taste, I really suggest you try this one at a good bar. 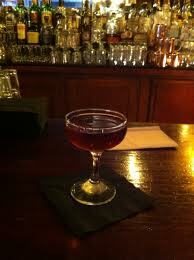 Go to the Pourhouse or Boneta or the Refinery and ask for a Red Hook with American rye. This is the drink that made my lady realize that not only does she not hate whiskey, but she kind of loves it. And lastly, a thank you to Darcy and his partner in crime, Lindsay, for putting me up in Brooklyn during my one visit to New York. Without that generosity I never would have been able to see that beautiful city. Cheers!